Bill Blain comments in Blain’s Morning Porridge, “Back on Planet Sensible, I was asking round the trading desks this morning for any particular themes or issues they’ve been picking up from clients. Nobody seems to be enjoying February. USD futures are rising modestly, but consistently in the overnight session. The Cycles Model indicates a probable burst of strength today. In addition, there appears to be another burst of Cyclical strength through the week starting March 5. ZeroHedge reports, “The dollar rose to its highest level in a week against its G10 peers on Wednesday, rising for the 4th day against the yen and most pairs as investor focus shifted to the minutes of the Federal Reserve’s last policy meeting. TNX futures have levelled off during the overnight session. It is very late in the Master Cycle so the chance of a low appears to be disappearing. 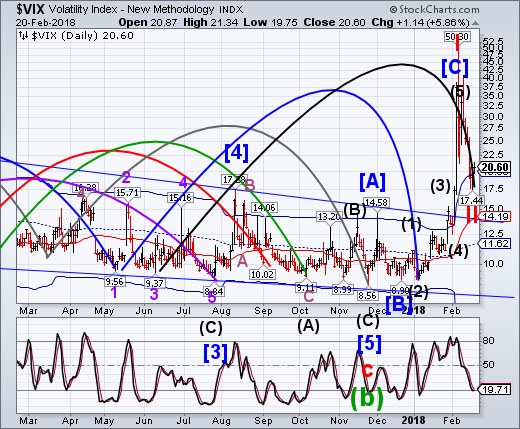 Instead, it appears that there may be a Cycle inversion, where TNX hits its Wave (5) high over the next two weeks. The alternate view may be that the Fed disappoints, causing TNX to pull back. 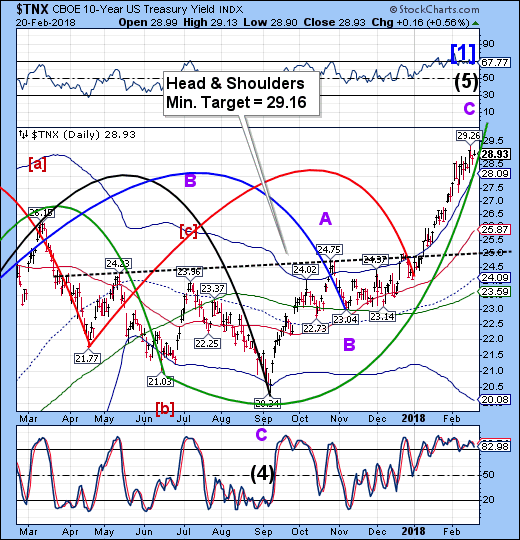 The weekly chart shows a potential Cup with Handle formation with a probable target of 39.33. 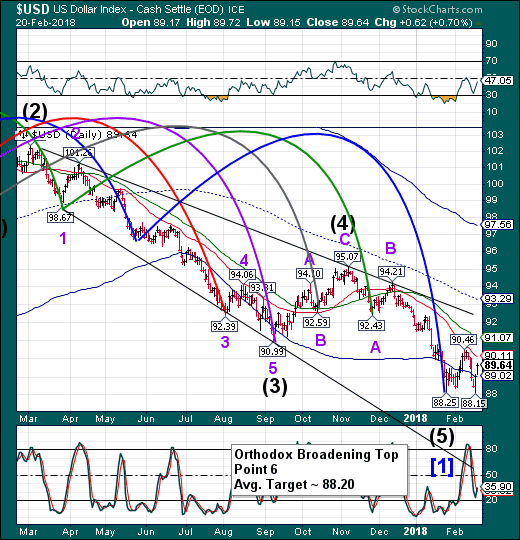 Cup with Handle formations target the end of the final Wave of a series (Wave 5). That would change my view on the current count, should TNX have a pullback over the next week or two. ZeroHedge comments, “The Dollar is suddenly rising and rate hike expectations are now at their highest of the cycle - 2.76 hikes in 2018 are priced in - (despite stocks still not being anywhere near back to pre-Powell-put-implied levels). VIX futures appear to be pulling back this morning. It may simply be a retest of the Cycle Top support at 19.83. 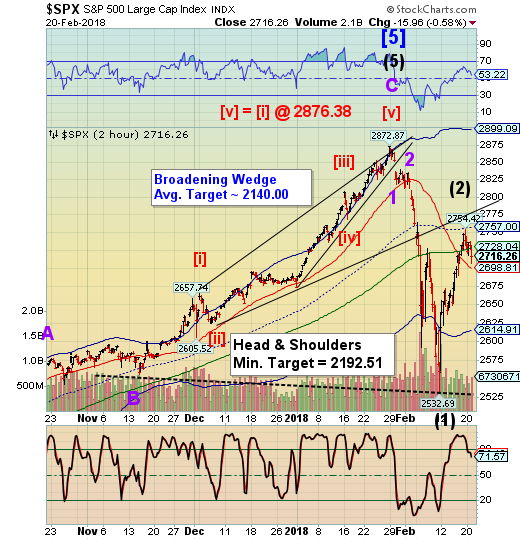 It appears that the markets are on a narrow consolidation until this afternoon. We are in the process of updating our website at www.thepracticalinvestor.com to have more information on our services. Log on and click on Advisor Registration to get more details.